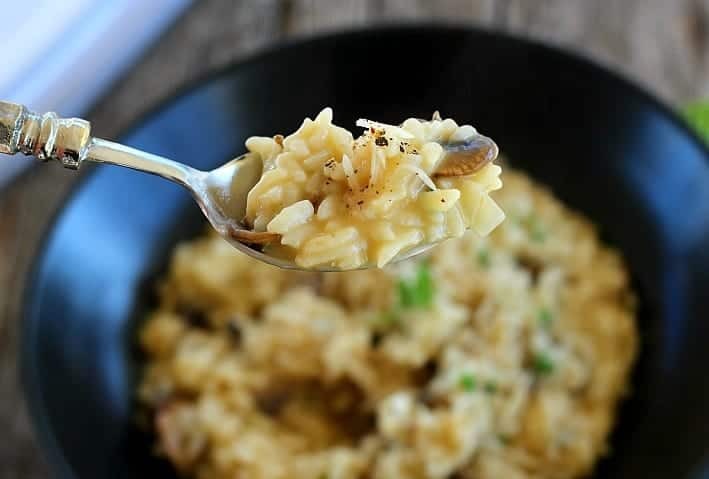 Mushroom Risotto in the Instant Pot is creamy, like the traditional method, tastes delicious, also like the traditional method, but isn’t time consuming and requires almost no stirring… which is not at all like the traditional method. First you need to saute’ your mushrooms and you could actually do this part in the Instant Pot too, but I really love this dry-saute’ method that I do using a cast iron or non-stick skillet (The linked recipe adds butter and or wine at the end but you omit that part for this recipe). The dry-saute’ browns the mushrooms perfectly using the liquid that they release naturally hence no need for extra butter or oil at all to achieve the browned, toasty goodness. After the mushrooms are finished, set them aside to be added in at the end of the recipe. In the Instant Pot, beautiful shallots get barely caramelized on the Saute’ setting with a little olive oil. 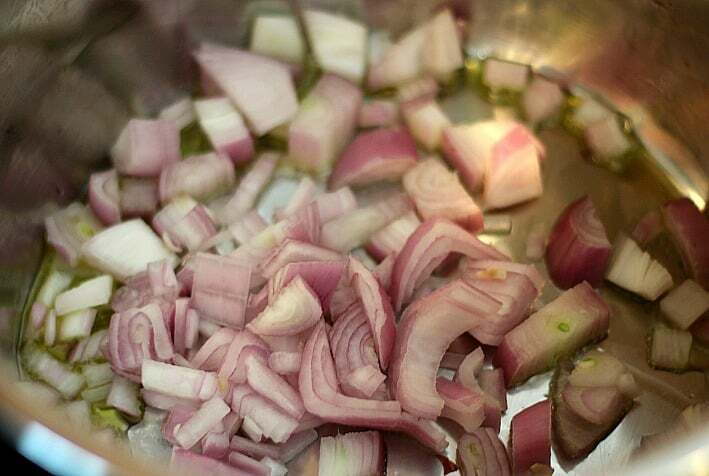 Shallots are so great in risotto, adding a mild blend of onion and garlic flavor. Next add Arborio rice. Any short grain rice will do but Arborio is the ‘it’ ingredient. 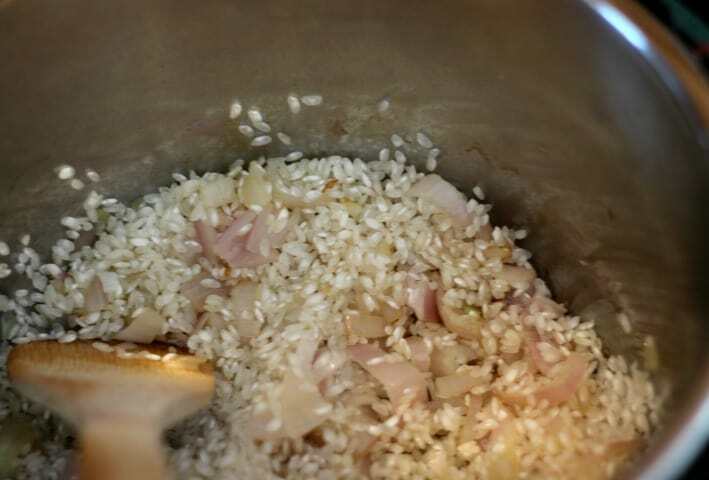 Stir the rice and shallot mixture to help the remaining oil from the pot to coat the rice. A little white wine here adds a nice zing to the risotto but you can substitute half water and half white vinegar. Let the wine cook down completely. Now add vegetable broth and make sure all the rice is submerged. 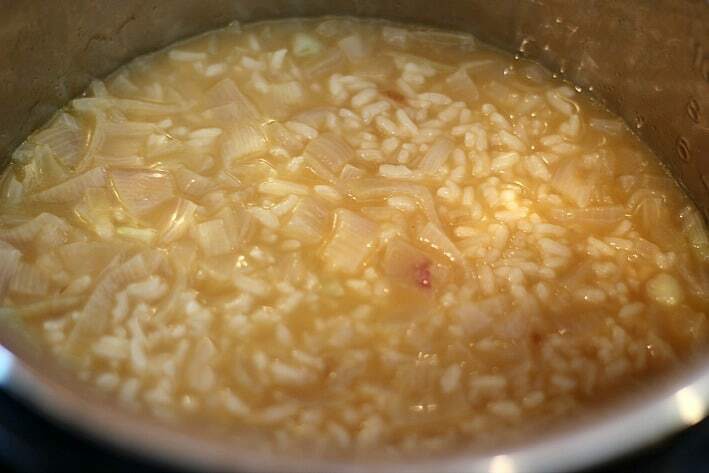 Use less broth than when making traditional risotto. The Instant Pot is then manually set for just five minutes of cooking time and another five minutes of natural steam release time. The risotto will immediately appear rather soupy but that changes quickly once you stir it and with the addition of the remaining ingredients. Right into the Instant Pot add the cooked mushrooms, Parmesan cheese, butter, and fresh parsley. A note for my vegan friends; I’ve omitted Parmesan cheese and subbed in vegan butter many times and it’s fabulous. 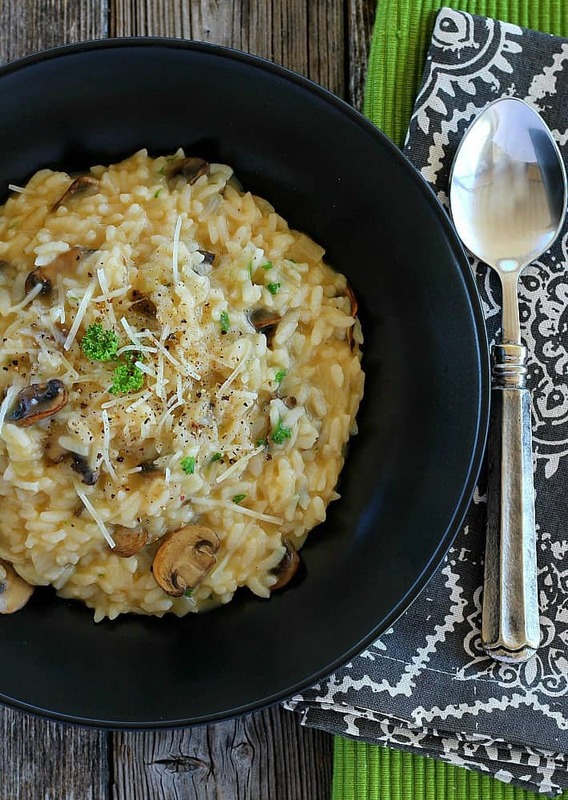 Seriously perfect Mushroom Risotto… in the Instant Pot! I’d put this up against any risotto ordered at a nice restaurant. See how the rice has released its fabulous starch for that creamy texture that risotto is famous for. It absolutely is comfort food times ten. Our family enjoys Mushroom Risotto as a meatless main dish, served with a large tossed salad. The flavors in the risotto are complex enough and completely satisfying to stand for a meal on its own. If you’re needing a little protein, smoked salmon on the side is excellent or you could also add cooked chicken or shrimp to the risotto itself. This dish is definitely at its peak when served immediately because of the perfect amount of liquid creaminess. This gets absorbed over time especially in the refrigerator but leftovers are still delicious Yes, I keep using words like fabulous, delicious, excellent, satisfying. But it IS that good! 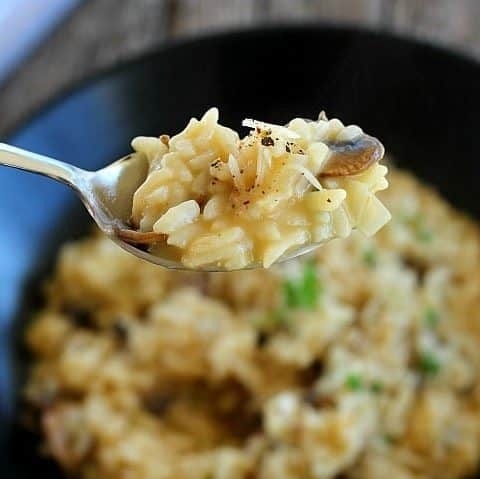 Save Mushroom Risotto in the Instant Pot to your “Instant Pot Recipes” or “Meatless Main Dish” board and let’s be friends on Pinterest! 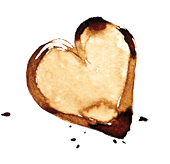 I’d love to share tasty recipes with you. Authentic Mushroom Risotto in less than 20 minutes from start to finish. 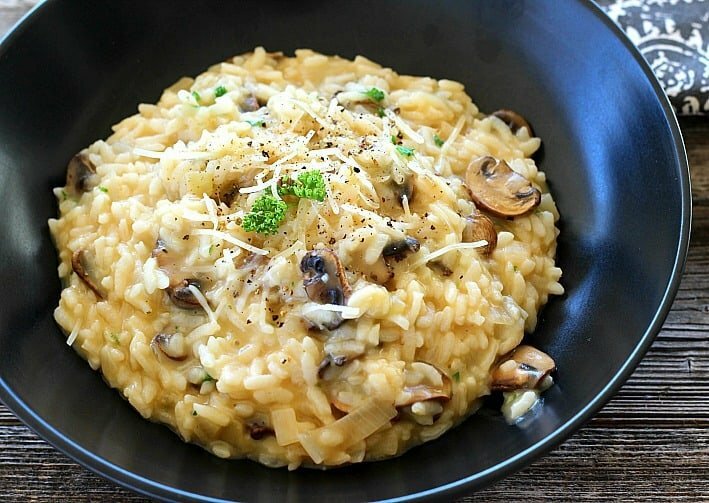 This recipe produces creamy, flavorful risotto every time. This is best served right out of the Instant Pot to experience the best silky texture of the risotto but leftovers throughout the week are also amazing, just not as "wet" as when first served. Reheating with a little extra water and pad of butter helps recreate the creamy original texture, however. 1/2 cup Parmesan cheese, shredded. Plus additional for serving. Heat a large cast iron or non-stick skillet to medium-high heat. Add mushrooms directly to the pan without oil or butter. As the mushrooms begin to release their natural liquids, add about 1/2 teaspoon of salt to help the moisture continue to release. Stir occasionally until mushrooms become browned to your liking. You shouldn't need to add any butter or oil to the pan but if you like, you can add about a teaspoon during browning. 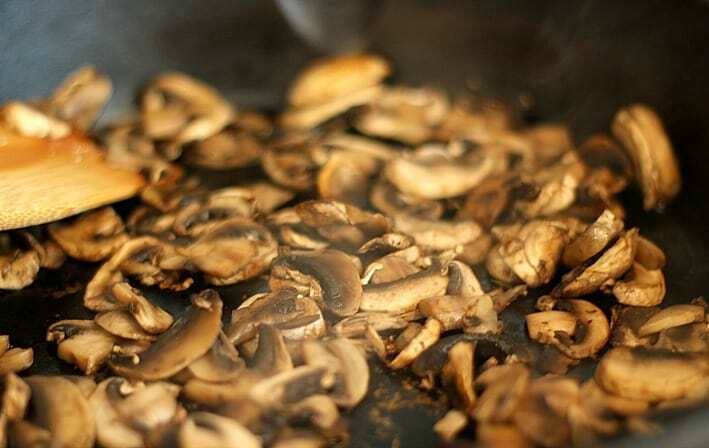 Remove mushrooms from heat and set aside. Turn the Instant Pot to Saute' and add 1 tablespoon olive oil and the chopped shallots. Stir frequently until shallots begin to slighly caramalize, about 3 minutes. Add the Arborio rice and stir to coat with the oil that's already in the pan. Add 1/2 cup white wine or a combination of water and white vinegar. Stir and cook until the wine has almost completely evaporated. This takes less than a minute. Add the vegetable broth to the rice mixture and stir briefly, making sure the rice is submerged. Place the lid on the Instant Pot, turn steam release nozzle to Seal. Using Manual button and High Pressure, set time for 5 minutes. Pot will take about 3-4 minutes to reach desired pressure before starting to count down the 5 minutes. Once the cooking has completed and the Instant Pot beeps, let pressure release naturally for 4 minutes before turning nozzle to Vent to finish releasing the steam. Remove lid from Instant Pot. Add, salt, 1/2 cup Parmesan cheese, 4 tablespoons butter, and the sautee'd mushrooms. Stir until butter and cheese have melted. Add fresh chopped parsley. Stir again. Taste and add fresh ground black pepper and additional salt to your liking. Serve immediately with extra Parmesan cheese, if desired. To speed things up even more, you can start the shallots in the Instant Pot at the same time you're browning the mushrooms. Just keep an eye on the mushrooms and stir them occasionally. The risotto is at its creamiest when served immediately but leftovers are still delicious. 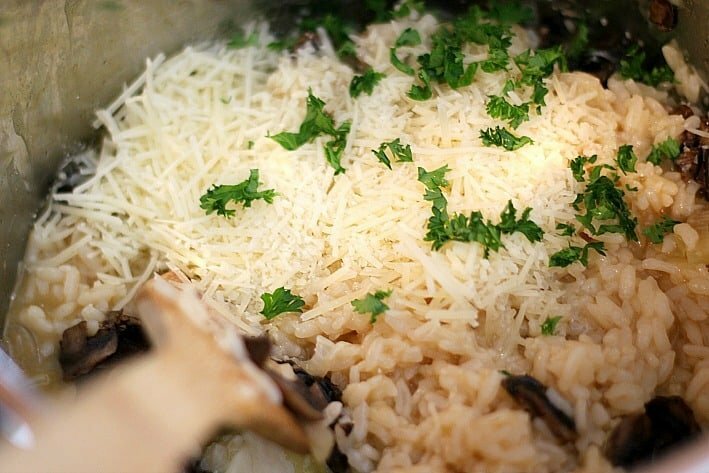 Store leftover risotto in the refrigerator in an airtight container for up to 5 days (it won't last that long). Loved this risotto!!! Did not know that I could cook risotto at home before this. Recipe notes: I used the 8 oz. of cremini mushrooms I had, used chicken broth instead of vegetable broth, and used 1 Tbsp. of butter, rather than 4 Tbps. We received an Instant Pot for Christmas and have been looking for recipes. Made this for the family today, Absolutely Delicious and it is defintely going in the recipe book. I’m trying it with asparagus next time. Thank you. P.S. It is the first time I’ve ever browned my mushrooms in this manner, easy and delicious as well. This was delicious! I halved the recipe and substituted half a regular onion with a bit of garlic powder for the shallots, and it turned out great. I will definitely be making this again. I’m dying to try this but have 2 questions. I don’t have shallots but Google’d and one sub says to use an equal amount of cooking onions but another said to also add some garlic powder. Which would you recommend? Also, I’ve always been told to rinse rice but I don’t see that in the instructions. Will that alter the outcome? Thanks in advance! Hi Sally. I finally got around to making it. I did use one small onion and a tsp of garlic powder as a sub for the shallots. I also subbed water and vinegar for the wine. I used 1 lb of mushrooms and found that to be enough. I also took your advice and didn’t rinse the rice. I loved it. I’m wondering if you ever doubled the recipe? I know some recipes won’t turn out the same, Next time I’d like to use white wine but since I don’t drink wine, I didn’t want the rest of the bottle to go to waste. I’m sure portions can be frozen. Have you tried that too? Thank you for the reply and info. I did not know you could freeze wine since alcohol doesn’t freeze. I made limoncello in my Instant Pot and added the max sugar as it was too tart for me and it ended up being a slushy (which I love). lol I just hate buying wine and then trying to find recipes to use it up quickly. I usually read comments before making a recipe but I guess I forgot about one’s re doubling as it’s been a week since I first saw it. Thank you so much. Will be doing this again soon! Ha! Actually, you’re right. I forgot about the wine not freezing. I don’t drink wine very often so that slipped my mind. Thanks for this recipe! It has been a huge hit with friends and family! I have modified it a couple times – I added baked cauliflower and asparagus instead mushrooms and it worked well too. My son loves this recipe so much he has requested I make it for his 3rd birthday dinner tonight for him and his aunts, uncles, and grandparents. Ideally I would like to double the recipe for the large group tonight – is that possible? I have a 6qt Instant Pot. Thanks again for this great recipe! I doubled the recipe, and didn’t add any more time to it. The taste is good, but the texture is pretty thick and gooey. It almost looks like I made oatmeal. This was my first time making it so I’m not sure if that’s how it is supposed to be. Julie, I’ve never doubled the recipe. Next time, try a single recipe and see if it’s more successful for you. The birthday meal was a success and everyone went back for seconds of the risotto! Even though it worked out I wouldn’t recommend doubling it. I got a burn notice on my Instant Pot before the pressure cooker count down even started and was pretty worried there wouldn’t be any dinner for everyone but luckily by the time the pressure was released and I checked on the risotto it was cooked! It had a thicker consistency when I doubled it that I didn’t really like but it still tasted good. 🙂 Thanks again for the great recipe! Love mushroom risotto but traditional recipes take so long – was so happy to see this for the Instant Pot! This is my second time making it and as an IP newbie I found the recipe to be easy to follow and the risotto is delicious! Thank you for sharing the recipe! Noelle, you just made my night! I’m so glad you liked the recipe and appreciate you taking the time to stop by and comment. I highly recommend my recipe for Polenta in the Instant Pot for you as well. Another dish that usually takes a while to make, but is almost too easy here. Thanks again and have a great night! Hi! I’ve been looking for a good mushroom risotto recipe, and the fact I can let this cook itself is a bonus! Do you think I can do Steps 1-4 ahead time, and then do the rest of the steps a few hours later? Ah! Thanks for your quick reply! 🙂 Yes, it would make more sense to try to do Steps 1-3 ahead of time (and not let the ingredients sit in the broth). I’m trying to have this dinner ready when we get after my kids have a class this evening…I’m just not sure how it would be if I made the whole dish ahead of time, and then let the cooked dish sit in the IP on the “keep warm” setting for a long time. 🙂 I’ll let you know how it turns out! Great, can’t wait to hear how it turned out for you! Hi Sally–the risotto turned out great! I sauteed the mushrooms ahead of time (since that always takes such a long time), and then started again from step 2, and my family loved it! Definitely a keeper. Thanks so much! I purchased the Instant Pot last week. This was the first recipe I tried. It is delicious!!! It was so easy. Highly recommend!!!! Mary, can I tell you how honored I am that this was the first recipe you made in your Instant Pot?! Thank you so much and I’m glad you liked it. I have several other Instant Pot recipes and highly recommend the Polenta as well. Have a great week and thanks for taking the time to comment. I made a half recipe of this tonight because I only had 5/8 cup of sushi rice. I added 1/8 cup of basmati to make 3/4 cup. Used leeks and a bag of frozen wild mushrooms and it turned out great! Same times as for the regular recipe. Great recipe! Have occasionally swapped in chicken broth for veg/white onion for shallot/sushi rice for arborio depending on what I had lying around, all with great success! Made this using a broth made from when I did a whole chicken in my instant pot…OMG. So good! Will definitely be making again. I liked the idea of a different cheese mix like I saw one commenter mention. Yum!! Excellent recipe. The family loved it. My wife is somewhat of a risotto snob and even she approved. Question????? If I double this does the cook time double or 1 1/2 ( 7 1/2 minutes ). Release pressure time? Thank you! Hi Joshua, I’m so glad your family loved it, especially your wife since it sounds like she knows her risotto! I’ve never doubled this recipe but have seen some advice online for doubling recipes. Just Google “double recipe in pressure cooker” and you’ll get lots of advice. Thanks again for making the recipe and especially for taking the time to comment about it. Elena, I’m so glad you liked it and I’m smacking my head for not saying to just cook the mushrooms in the Instant Pot in the first place, too. The cheese combination sounds heavenly! This was my first instant pot recipe and it was so good! Better and easier than any rissoto that I’ve made stovetop. (Not something I elect to do often because it hurts my arms! Lol) the broth I used was really “brothy” so it flavored the whole dish like that. I’ll probably sub 1 cup of water and 3 cups of broth next time. Hi Deborah, I have a recipe for the Mushroom Risotto on my site for the stovetop. The link for it is in this post or you can just type in Mushroom Risotto in the search box on my homepage. Thanks for stopping by and I hope this is helpful for you! thank you, Sally…I will try this for Sunday dinner. I tried this recipe tonight and it was just so good! Thank you so much for sharing your excellent work. Thanks so much, Molly! I’m glad you liked it and I really appreciate you stopping by with your comment. Have a great weekend and I hope to hear from you again. Wow! This was excellent! The recipe was easy to follow and made for a yummy, filling dish. Thank you! This was so delicious – definitely a crowd pleaser! Didn’t even realize you could brown mushrooms like that without oil or butter. This recipe differed from others because it didn’t require crisping the rice on the sauté function but it came out perfectly. Added a bit of lemon zest/juice at the end and served with salmon as per your recommendation. So good – thanks for the great recipe! Thanks Sarah, I’m glad you liked it. We just had this rice for dinner (again) last night, ourselves. Wow I can’t believe how easy this was! And so delicious! 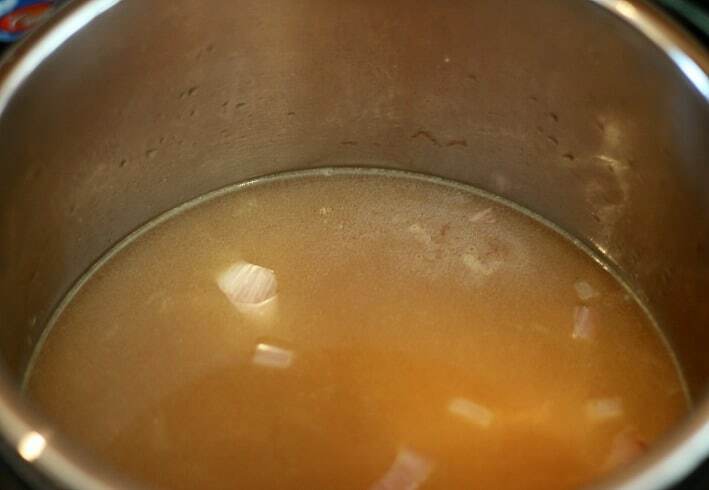 I used homemade chicken stock that I also made in my Instant Pot instead of the vegetable. Definitely a keeper. Thanks for sharing! Thanks Kristyn! I’ll bet the homemade stock made the risotto even more special. This is definitely one of our favorite Instant Pot recipes. I appreciate you taking the time to stop by and comment. Too Wonderful, a great new thing to throw in the hot pot! gonna do it! Thanks James! It’s one of our favorite recipes. This was so easy! Thanks so much for all the detailed photos. Well done. Thanks Laurie! Glad the photos were helpful. Can I just say “thank you!”? This was easy, absolutely delicious and goes with everything! If I could figure out how to post a pic of mine, I would. It was that good and looked good too! Kathy, Thank you so much! What a great comment to find just before the start of a new week. 🙂 I’m so happy you like the risotto as much as we do around here. Stay tuned for Beet Risotto and Asparagus Risotto to be posted later this week.